Brighton & Hove Albion goalkeeper David Button will be prepared for penalties at West Brom on Wednesday evening. The Seagulls travel to the Baggies for their FA Cup fourth round replay at the Hawthorns, with a 8.05pm kick-off. 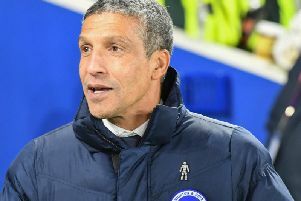 The teams drew 0-0 at the Amex last month and Button admits he will be ready if the game goes to extra-time and spot-kicks. He said: "We will go quite in detail on the opposition, so will look at their penalty takers regardless of if it will be a penalty shoot-out or not. "I'm sure we'll do that little bit of extra homework for it just in case. "But it will be nice to get through however that happens. Penalty shoot-outs are a chance for a keeper to be a hero but at the same time it's a bit of a lottery. I'd rather us win in normal time." The winners of Wednesday's tie will host Derby in the last 16 and with 13 Premier League teams already out of the competition, Button said: "You don't want to get too far ahead of yourself. "Obviously there's no easy games but the teams that have gone out already, it could be a good year for a team like ourselves to progress and do quite well in the tournament." ​Is West Brom v Brighton on TV, what's the team news, what are the odds?